Splendors and Glooms by Laura Amy Schlitz. Grades 5 and up. Candlewick, 2012. 384 pages. Review copy provided by my local library. It's Clara's birthday and all she wants is a day of fun and frolic, a day she doesn't have to think about her poor lost sisters and brothers who died of cholera, a day when Grisini's marvelous puppet troupe will perform for her and her friends. Clara is fascinated by Grisini's puppets and by the children, Lizzie Rose and Parsefall, who bring the puppets to life. When Clara mysteriously disappears after the puppet show, suspicion immediately falls on Grisini, and as Lizzie Rose and Parsefall struggle to untangle the mystery, things will take a turn for the deadly. 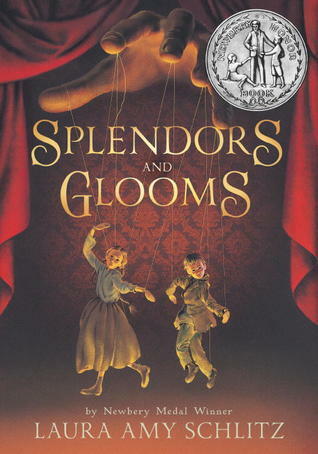 Splendors and Glooms has the feel of a classic and I think it's a book that could appeal to a certain subset of a wide range of ages. Certainly it's a dark story with dead siblings looming over Clara's head, an evil witch plotting against children, and a diabolical puppet master who will stop at nothing to increase his own wealth. But it's also a story with a lot of love and hope and characters who strive to do the right thing and to protect each other. I can see this being a very special and beloved family read. This book... made me feel the feelings. I got caught up in the lives of the characters and Laura Amy Schlitz broke my heart in certain scenes. Her carefully chosen words bring across the pain and betrayal felt by Clara, Lizzie Rose, Parsefall, and the witch Cassandra in a vivid way. They also bring the setting to life, from the dirty streets of Dickensian London to the crisp, clear winter at the witch's estate. The book started off a little slowly for me, but once I was hooked I was hooked and I couldn't put it down until the story, with all its twists and turns, had played itself out. This is a book to lose yourself in and I'd hand it to kids looking to be transported. Readalikes: As I was reading, I kept thinking of the book A Little Princess by Frances Burnett because Clara reminded me of Sara Crewe. I've not read it, but I've heard comparisons around the interwebs to The Wolves of Willoughby Chase by Joan Aiken, so I'd try that one as a readalike for its setting and storyline. Splendors and Glooms won a 2013 Newbery honor and it's also been reviewed by these fine folks: Book Nut, The Book Smugglers, A Fuse #8 Production. It's on shelves now!